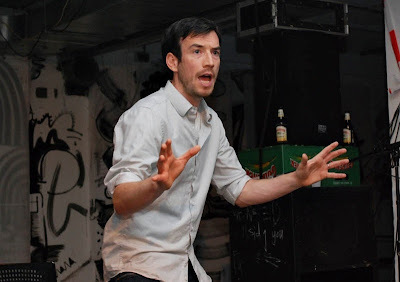 I debuted my long-awaited (at least by me) new solo improv show last Saturday. I've been scheming on The Pitch for quite awhile now almost a year and a half), and working it over in my mind as a concept and as a practical project. It's been a struggle to make it come together in the way I want it to. And even a struggle to think of how I'd like it to come together. But over the time I've been thinking and scheming about plot and story, reading books, writing spec improv features, but I've never actually put it on stage. That needed to change. And finally it did. It just took a deadline. A couple of months ago I was invited by the organisers of The Amsterdam Free Fringe to their Saturday night showcase, and given a twenty minute slot. I said I'd do The Pitch. Then, once that was in place, I needed to get it ready. So last week I worked on making it happen, dreaming up how it would work, how I would interact with the audience, which elements I'd developed would be included and trying some out in my empty living room. Then I got Chiara involved, and she gave me lots of useful input, and even pitched a film idea to me, which was pretty wonderful. And that night I did it, in an underground bunker, as part of perhaps the most eclectic and bizarre line-up I've ever been a part of. German punk hippy electrodub, solo modern dance, and other acts that defy description. And in the middle, me doing The Pitch. Well, I had a lot of "help". Most of the show, especially the part where I actually pitched the movie title the had audience had voted for ("The Day After the Mushrooms") involved me dealing with a far-too-drunk heckler, and attempting to incorporate his suggestions into the feature film-worthy plot I was narrating. It was about a pair of young brothers trying to survive in a post-apocalyptic world, and it was pretty good. Excepting the overzealous guy in the backrow, shouting at every opportunity. It was mostly good fun, but he was also being a pain. But I got my revenge. 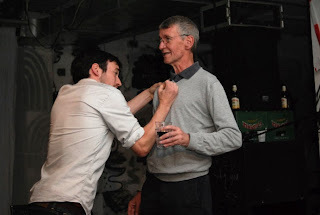 In the last climactic scene, I got him up on stage (as I had warned him I would do), cast him as the villain, and then I, in character as our young protagonist, stabbed a mime mushroom through his heart, which the audience seemed delighted with. I sure was. To his credit he died a relatively convincing death on stage, slumping into a chair and playing a corpse who only very occasionally sipped his red wine as I wrapped up the show. And that was that. They were not ideal circumstances to give The Pitch its first run out, but all things considered, I thought it went quite well. I look forward to trying it out, utilizing some other elements, and building the show up into something more substantial and fixed. And, not least of all, corralling the audience into giving helpful rather than uncalled-for input. But if that fails, I can always mime-kill the heckler on stage. Which in this case not only gave a nice finish to the story I narrated, but a nice finish to the meta-show that was playing out.